The Illinois Food Scrap Coalition (IFSC) is a group of more than 150 businesses, solid waste agencies, county governments, state and federal agencies, universities and nonprofits that have organized to promote food scrap composting across Illinois. The IFSC grew out of a one-year food scrap composting forum planning process initiated by Seven Generations Ahead. IFSC supports research, programs, education and policy initiatives. Food Scrap Composting Challenges and Solutions in Illinois Report see below for detailed info on this project). Funded by the Illinois Department of Commerce and Economic Opportunity (DCEO), the Food Scrap Composting Challenges and Solutions in Illinois project was designed to advance food scrap composting through research, stakeholder forums, an analysis and recommendations report and advocacy. Seven Generations Ahead, in collaboration with the Education Committee of the IFSC, designed and directed the project. The executive summary and recommendations report was presented to the Illinois General Assembly’s Task Force on the Advancement of Materials Recycling in November 2014. The final report was completed in January 2015. You can read the report in its entirety here: IFSC Food Scrap Report 2015. 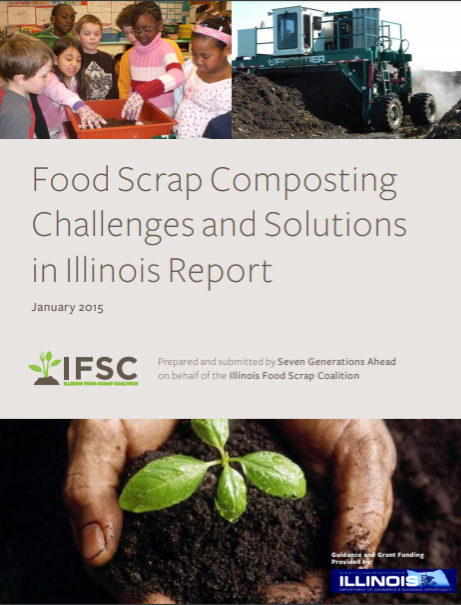 Or read the Executive Summary for the Food Scrap Composting Challenges and Solutions in Illinois Report. In December of 2016, an economic impact and market study report was conducted. The results and recommendations can be found here. Educate Illinois stakeholders (food scrap generators, waste haulers, compost site operators, state agencies, non-profits, industry associations, lawmakers, regulators, the public at-large) about policies and statewide approaches that are diverting food scraps from landfills and advancing composting across the country. Analyze barriers, challenges and opportunities related to advancing food scrap composting in Illinois. Develop a set of recommendations for advancing food scrap composting and creating related jobs in Illinois. Create and disseminate a report. Advocate for recommended policies and strategies to promote food scrap composting in Illinois. 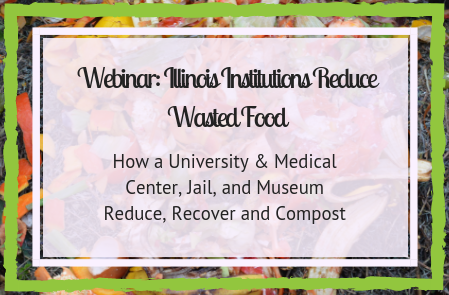 SGA has also produced several webinars through the IFSC Education Committee focusing on Illinois entities reducing wasted food via composting, recycling, and food recovery and food share programs. Click here to view or download all of our webinar resources as recordings and PDFs.